Workout: Warm [2 mi. ], 3 miles @ 6:29 pace, Cool [2 mi.] Weather: 70 degrees, sunny. Easy work out there today. Wore the regular road racers at the park again. Upped the warmup from 1.5 to 2 miles today. 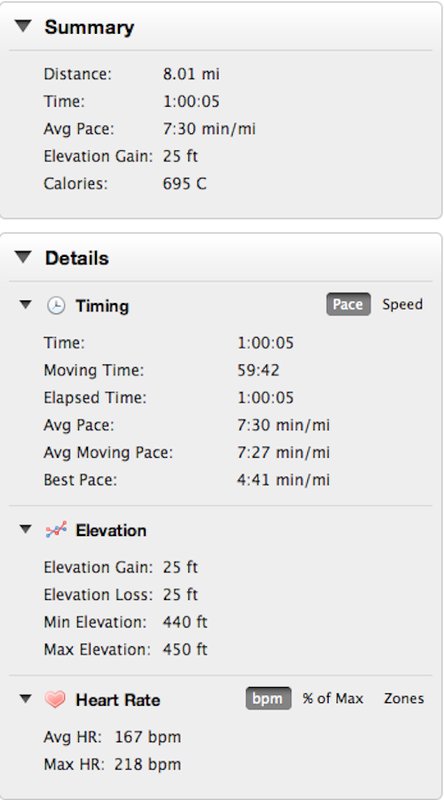 And increased the goal pace from 6:33 to 6:29 over three miles as well. Since I completed the run at 6:24 pace last Tuesday, the only question for me was would the added mile of warmup and cooldown be a factor. Everything was smooth out there. Wanted to focus on breaking the 3-mile tempo portion into 6 x 0.5-mile portions mentally…like my speedwork. For the first 0.5 mile, just think about that 0.5 mile and then move on. It also helped a lot that I’d done the speedwork last week in the same park location. Didn’t take long to realize that I didn’t need to move at speedwork pace. After 1 mile, it was clear that this workout wasn’t going to be a problem at all. No extra straining or tension in my upper body. Legs were moving backwards pretty evenly. 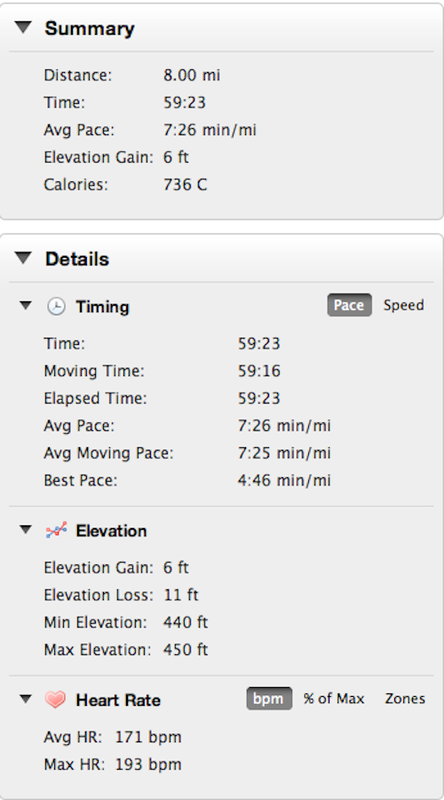 After 2 miles, I wondered how long I could carry on at this pace…6, 7, 8 miles? No telling. But today wasn’t the day to find out. A key part of training is control. Sticking to the plan even if you think you can do better. Not giving up easily when you think you can’t. 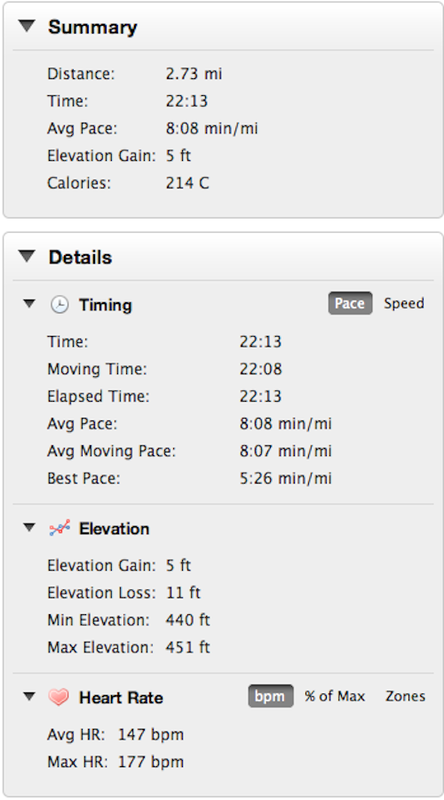 Today I settled down at 6:22 pace for the tempo portion of the run. The end game for these tempo runs is 3 miles @ 6:08 pace in December with a 3-mile warmup and cooldown. It’s quite possible that I can complete this workout already. So the goal has to be a little different than completion in order for me to stay motivated. I won’t be able to set a personal best for a tempo run session because of the hard running that I did early in the summer. At some time in June, I was able to complete a 3 mile run faster than anything I have planned this year. 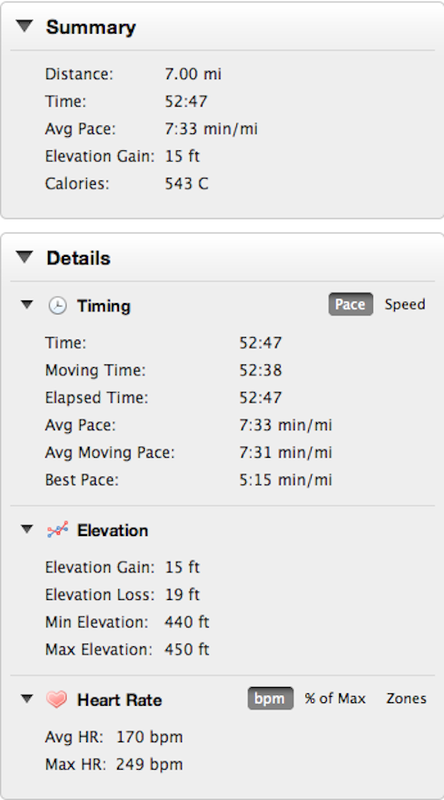 I won’t get a chance to exceed this pace until January at the earliest. So the goal will have to be comfort. These tempo runs are supposed to be my 10K pace done at the 5K distance. 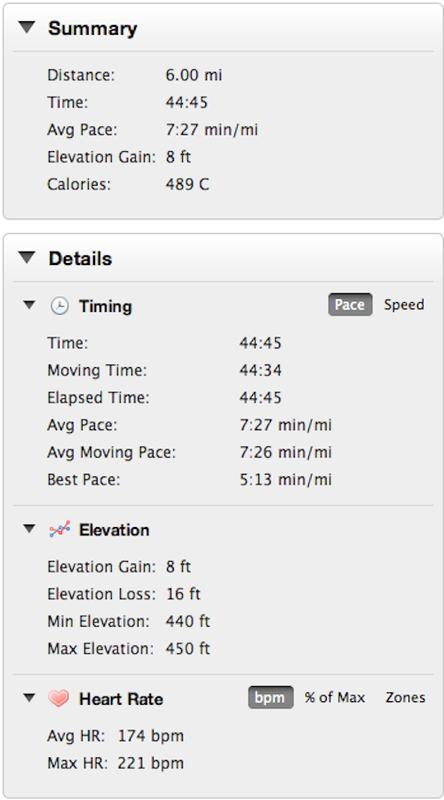 In order words, if my predicted 10K were 40:00, I need to do this tempo runs in roughly 20:00. Accordingly, I’d like to able to complete all these tempo runs at a pace comfortable enough to carry for 6 miles. *Longer slower runs on “off days”. *Form drills after hard workouts. Regardless, it’s great to have optimism and be looking forward to the next run.